Are you thinking about learning, or struggling to learn, how to feeble hard 180 and you need some tips and advice on how to get it done, here’s a video for you. Anthony Panza put together this video with a bunch of tips and examples on how to feeble hard 180 that should help you figure out how to get the trick done. This is a mid level difficulty trick, so it will probably fight you a bit when you’re first trying to figure it out, but once you have it locked in, it will become a lot easier to do! Hit play, take it all in, grab your bike and send a few! It has been a little while since we’ve checked out a GoPro POV video where Billy Perry and crew cruise through the streets of New York City. Here’s a fresh one where he cruised with a bunch of people through some heavy traffic. As always, these guys look like they have a blast. Take a look! Get a look at the Anthony Panza signature 2 Short colorway from Cult! Anthony went with a clean white color with some custom graphics and a FTL logo on the head tube. 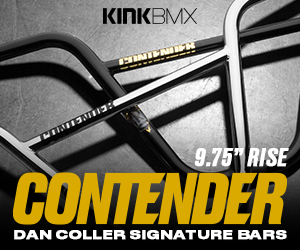 The 2 Short frame is made from 100% revised Cult classic tubing with a 75.5-degree head tube angle, 70-degree seat tube angle, 11.7″ bottom bracket height, and 8.65″ standover height and a 12.5″ – 12.8″ chainstay length. You can find an integrated head tube with gussets on the top and down tubes, an externally machined Mid bottom bracket shell, an Investment cast seat post clamp and seat stay bridge, tapered seat stays, S-Bend chainstays and 5mm thick heat-treated dropouts. The 2 Short frame is a brakeless frame so there are no mounts for brakes. You can pick up the Anthony Panza signature 2 Short colorway in 20″, 20.5″, 20.75″, 21″ and 21.25″ top tube lengths for $349.99 through BMX shops and mail-orders that carry Cult worldwide now. The summer is here and the warmer temps has meant plenty of riding. Billy Perry and crew have been taking advantage of the warmer temps in New York City as well. Here’s a video giving you a look at what the crew got into during a full day of cruising spots around Brooklyn. Take a look! Billy Perry, Anthony Panza and crew explore Brooklyn on a warm winter day for the latest Daily Cruise video! It has been a while since Billy Perry has put out a Daily Cruise video, but that changes today. Here’s a look at what Billy and crew got into while cruising around Brooklyn on a warm winter day with some sunshine. Hit play to see what a big squad got into throughout the day! “We met up with a huge squad of riders in Williamsburg, New York to start the day and continued to ride amazing spots all over Brooklyn while dodging concerned citizens, security, and the cops! Billy Perry and Anthony Panza square off once again for a game of BIKE, this time at Woodward East! It’s that time again for Billy Perry and Anthony Panza to play a game of BIKE. This time around they decided to play a game during their time at Woodward East! As always, these guys end up pushing each other and things get a little heated. Check out what went down and who took the win!